Whether it’s long-forgotten remnants of departed retailers, or 1980s fascias that chains have forgotten to update, there’s something satisfying about coming across bits of retail heritage in unexpected places. While some are just fun, others shine a serious light on retailers’ brand inconsistency, and the challenge of maintaining a uniform look across a large or ageing estate. Others merely remind us of quite how much the look and feel of our town centres – as well as the retailers that trade there – is constantly changing. With visits to about 300 high streets in the last three years now under my belt, I thought it was time to pull together ten of my favourite examples of shop signs that really ought not to still exist. You’ve seen one or two in previous blogs, and many of the others have been tweeted, but this is the first time I’ve shared them all in one place. So, in no particular order, enjoy! Sainsbury’s may have once said “Try something new today”, but it certainly hasn’t followed its own advice at Swindon’s Brunel shopping centre. 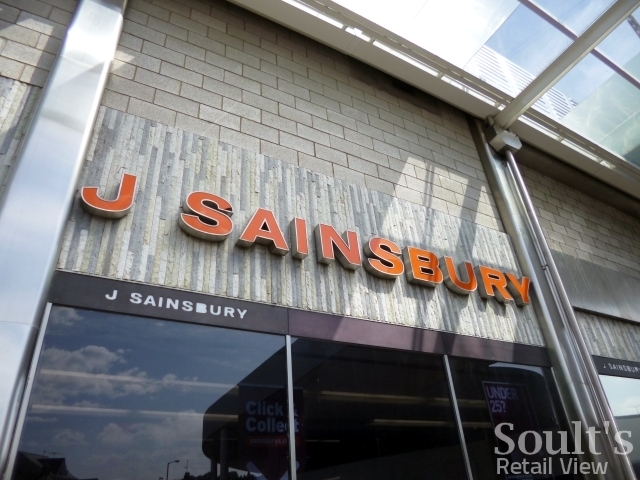 The town centre store still features the old ‘J Sainsbury’ logo that was superseded in 1999, as well as the original tiled floor and hanging aisle signage. With Sainsbury’s having done a generally good job of rolling out its new identity over the last 13 years, the existence of one or two legacy stores is especially surprising. This example of WHSmith heritage featured at Soult’s Retail View back in September 2009, but is always worthy of a revisit. 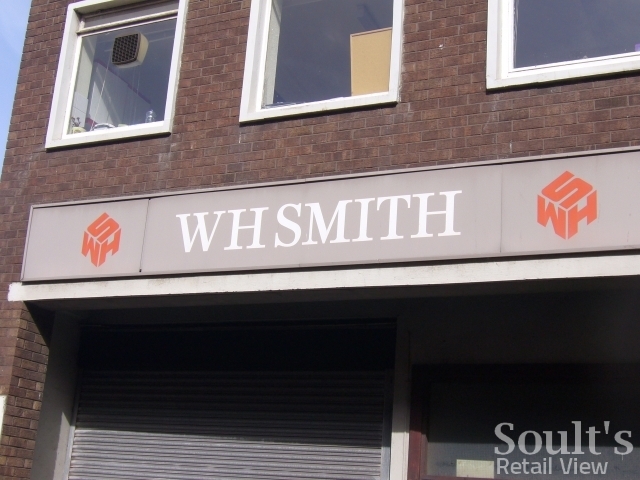 WHSmith’s iconic cube logo was replaced by the current white-on-blue fascia back in the 1990s, but the old-style signage at the back of the Redcar High Street store is a rare survivor. Its existence is even more bizarre given that the signage on the front of the building was replaced long ago. Each time I go back to Redcar I check to make sure the signage is still intact – I am yet to be disappointed. 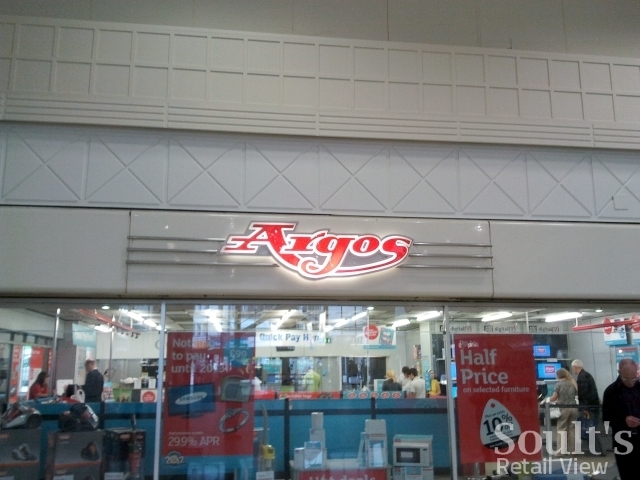 I’ve previously debated the merits of the current Argos logo compared to its predecessor, but a trip to Nottingham’s Broadmarsh shopping centre last week was the first time in years that I’d spotted the logo before that. Like Sainsbury’s, it too was replaced – in theory – in 1999. Capital Shopping Centres (CSC) – which owns Eldon Square and Metrocentre here in the North East, as well as Nottingham’s nearby Victoria Centre – purchased Westfield’s 75% Broadmarsh stake in November last year, before acquiring the remaining 25% interest shortly afterwards. Improvement works to the centre were well underway when I visited, so the legacy Argos signage may not be around for much longer. This is a funny one, where the fascia above the shop is different to what the shop actually is: a branch of Johnsons the Cleaners masquerading as Sketchley. 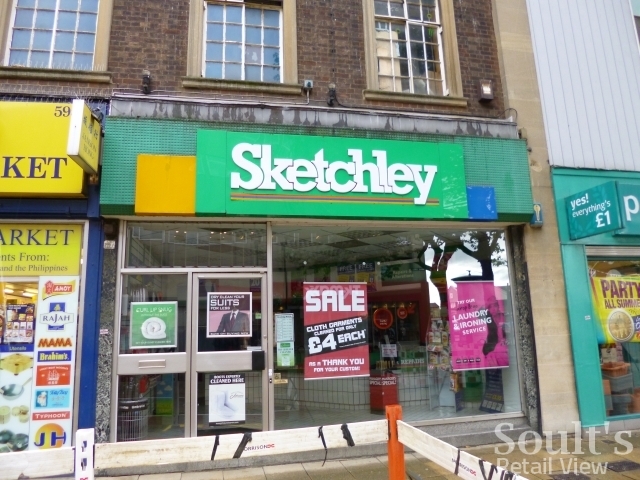 Sketchley has had a complicated history over the years, but basically disappeared from the high street after Johnson bought the chain – even then just a rump of its former self – from Timpson in 2004. This particular branch clearly escaped rebranding, though their’s no chance of it getting a makeover now: Johnsons’ website reports that the shop closed down on 21 August, so you’d better appreciate its ’80s signage while you still can. You could be forgiven for thinking that Littlewoods disappeared from the high street for good in 2006, following the sale of its 120 stores to Primark and its subsequent evolution into a prominent online and catalogue brand as part of the wider Shop Direct Group. That’s not entirely the case, however. 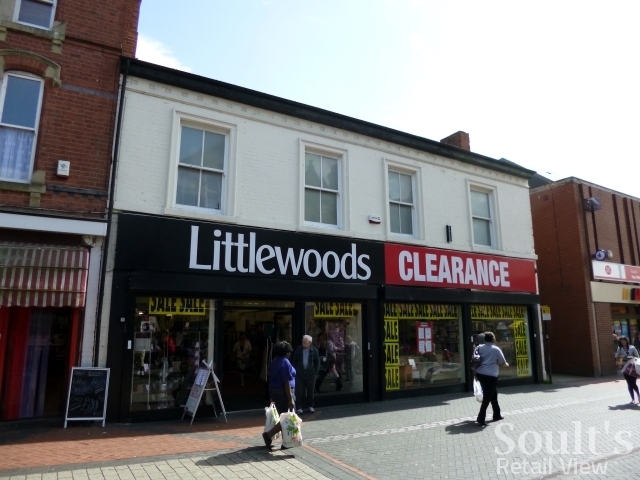 There are still 15 bricks-and-mortar Littlewoods Clearance shops across the UK, used for clearing the Group’s surplus stock, including this one in Bulwell, Nottingham that I spotted last week. The presence of yet another superseded logo makes its presence in this list doubly appropriate. This one’s a slight cheat in that the signage of the shop in question is long removed. However, there are no prizes for guessing that this used to be Reading’s branch of C&A, presumably empty since the retailer withdrew from UK shores in 2001. Friars Walk, where C&A was located, has the odd distinction of being a completely abandoned shopping mall in the heart of one of the country’s major retail centres. 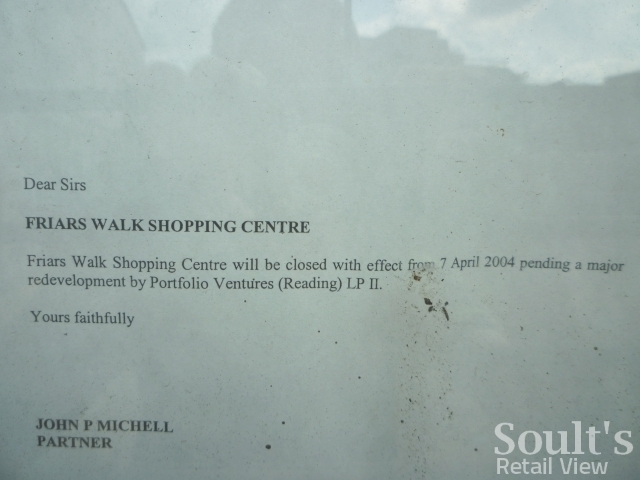 Notices still displayed at the entrances to the shopping centre inform customers that “Friars Walk Shopping Centre will be closed with effect from 7 April 2004 pending a major redevelopment”. Given the speed of progress to date – i.e. none – those traces of C&A signage may well be around for a while longer. This reminder of Uniqlo’s first attempt to crack the UK was covered in a blog back in March, but is worth sharing again. The Japanese fashion retailer opened its first UK store in September 2001, adding 20 more shops nationwide over the next 18 months, including one in Coventry’s Lower Precinct. After making a £20m operating loss within the first year, all but five stores were closed in 2003, with Uniqlo later refocusing its efforts on building a presence in London. 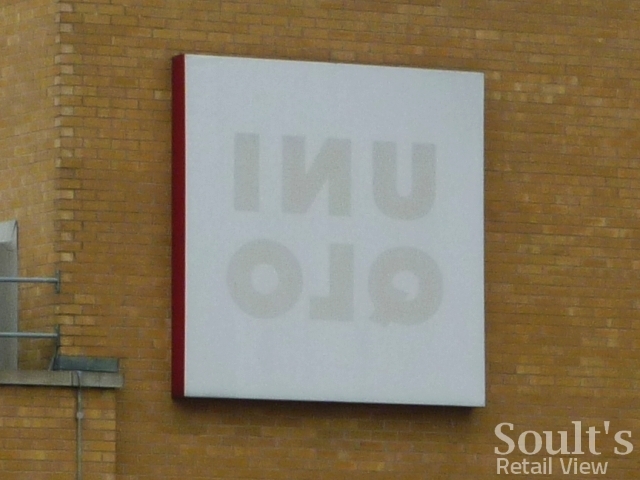 Nine years after Uniqlo’s departure from Coventry, and with Select trading from that unit today, the reason why the sign has been turned around rather than removed is anyone’s guess. 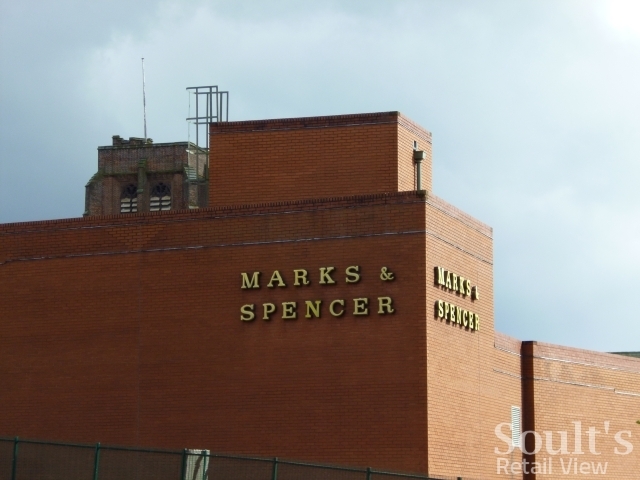 Marks & Spencer has more than its fair share of signage iterations across its sprawling and aged estate, though there are relatively few stores featuring the St-Michael-era logotype that can still be seen at St Helens. While the main Church Street frontage has the mint-green fascia that was rolled out in the early 2000s, the back of the Hardshaw Centre has one hanging sign featuring the yellow-on-green serif lettering that was common in the 1980s and 90s (nicely juxtaposed against the signage of a defunct TJ Hughes), as well as even older gold lettering on the side of the building (pictured at the top of this post). Given the relatively hard-to-reach location of that lettering, M&S can perhaps be forgiven for not having changed it yet. 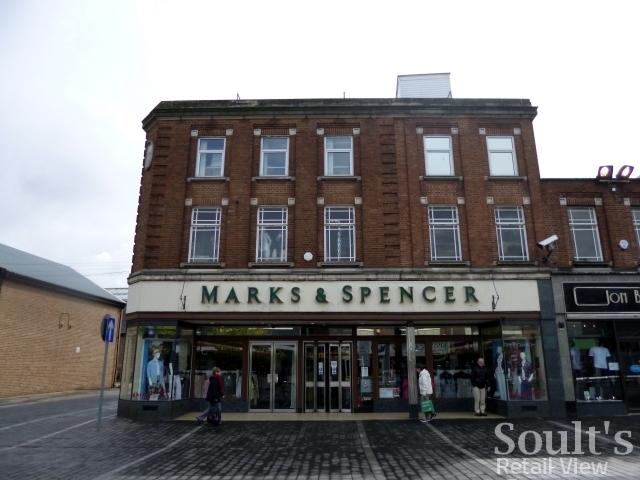 There’s no such excuse in Castleford, however, where the fascia of the town’s Marks & Spencer looks to have remained unmodernised for a good thirty years. The irony, I suppose, is that the consequence of this is a rather appealing frontage, with a rare combination of building, fascia and shopfront that are all in harmony with one another. As it mops up space left by the collapse of Woolworths, TJ Hughes and others, Poundland’s familiar turquoise fascia is becoming increasingly ubiquitous across the British high street. It’s therefore something of a surprise to stumble across a store in Wakefield that still features the chain’s original 1990s logo. 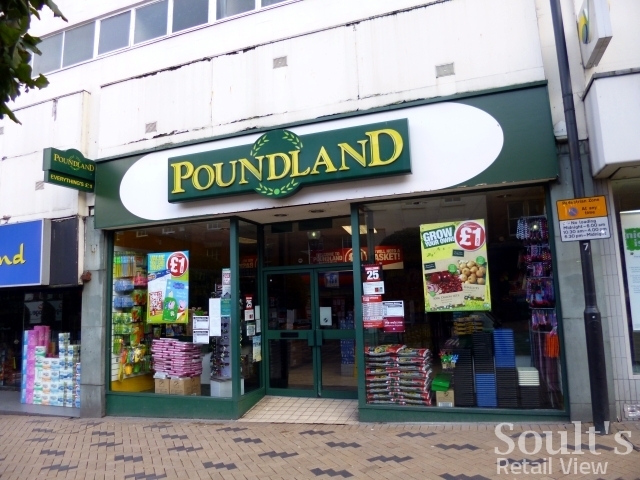 Compared to its sleeker and more corporate modern-day look, the old fascia is a reminder of how Poundland has gently evolved itself over the last couple of decades, turning initial scepticism about single-price retailers into its present mainstream respectability. This last example from the Prescot Shopping Centre is probably my favourite, as it features a retail fascia not seen since the early 1990s. 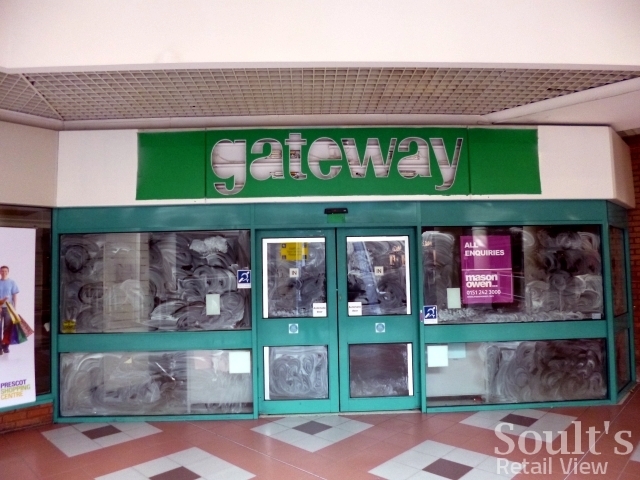 Again, all is not entirely what it seems: though the store appears to feature a Gateway fascia, this has only been re-exposed following the recent removal of the Somerfield signage that replaced it. The store only closed as Somerfield comparatively recently, seemingly dealt a final blow by the opening of a larger (94,000 sq ft) and cheaper Tesco Extra on the nearby Cables Retail Park. Still, there’s certainly no disputing that the unit grabs your attention – perhaps not for the right reasons – as you descend the escalator to the shopping centre’s lower level. 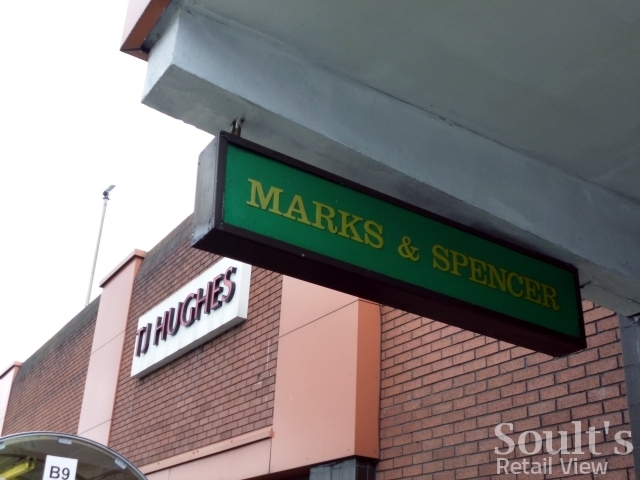 Inevitably, this collection of images is just a snapshot of some of the quirky big-name stores that I’ve come across on my travels – Soult’s Retail View readers will, I’m sure, have their own favourites. So, as always, feel free to share your own examples below, on my Soult’s Retail View Facebook page, or via Twitter to @soult. My retail consultancy business, CannyInsights.com, provides bespoke place- and sector-specific market intelligence, building up a unique knowledge and image bank through regular visits to high streets, shopping centres and retail parks across the UK. It also works with retailers nationwide to improve their stores, customer communications and market knowledge. For more information, visit www.cannyinsights.com, drop me an email, or give me a call on (0191) 461 0361. Previous story Does JJB Sports have a future? “Store 21” in Aberystwyth is displaying “old” signage (should be Store Twenty One), BUT on the right hand side it still has a B/Wise sign! It’s actually in a staff only area and can’t be seen from a distance due to facing another building right next to it, so I guess that’s why they never bothered replacing / removing it. I love this kind of thing! I spotted something similar in Rutherglen last year: https://twitter.com/soult/status/672424110853591041. The interior there was pure Bewise/B-wise as well! Wow haha! It had QS signs?! Come to think of it there is still an empty QS in Cardigan (Welsh: Aberteifi) that never became a Store 21, signs still proudly displayed! Thanks Rowan! Funnily enough, I was reading about the new M&S in Aberystwyth only on Friday – it looks like an impressive store, and good that it’s more or less in the town centre rather than being stuck on a retail park somewhere. I’ve never been to Aberystwyth – it’s a bit of a challenge to get to from the North East – but it’s definitely on my to-do list. The Blackpool branch of Wilkinson is in a (truly hideous) building that was once a FineFair, and the cladding along Talbot Road still has the interlocked Fs from that store’s branding. The whole building will be demolished in the next couple of years due to a planned extension of the tramway, I’ll try and get some shots before it’s too late! “Ah yes! That’s one of the Westgate department stores that Beales *didn’t* buy, isn’t it?” Sorry for the VERY late reply, but yes, you are correct that it is one of the Westgate department stores that Beales didn’t buy! ;) Before it was Westgate, it was an Uptons store. When it ceased to be Binns, strangely, it never closed down, it kept the same layout, and all that really changed was the singage on the front of the store! OMGosh! Only today I was taking photos of our Sainsbury’s Swindon (Brunel) store, especially motivated as they have finally decided to start refurbishing it. The store opened in 1974 and has been largely untouched in all that time. So the refurbishment is tinged with a little sentimental sadness as the old store furniture and features are gradually being replaced. This includes the old beige isle signage, beige wall tiles with the original circa seventies brown ‘S’ printed on each tile, brown floor tiles, ceiling tiles and I expect the shop facia signage ‘J Sainsbury’ will eventually go too. Ahh well, that’s progress for you. Apart from ambient shelving, checkouts and some refrigeration units, I swear to you, the store is the same now as it was when it opened. Really bazaar especially when you think Sainsbury’s starting rejuvenating their stores away from the old coffee brown image back in the late nineties. If you want any photos, let me know. Nearly 40years and still going strong can’t be bad. Just for fun! Just think when Sainsbury’s Brunel opened in 1974 the following food retailers were around: Liptons, Fine Fare, Bejam, Wavy Line, International, Key Markets, Gateway, Safeway, Carrefour. 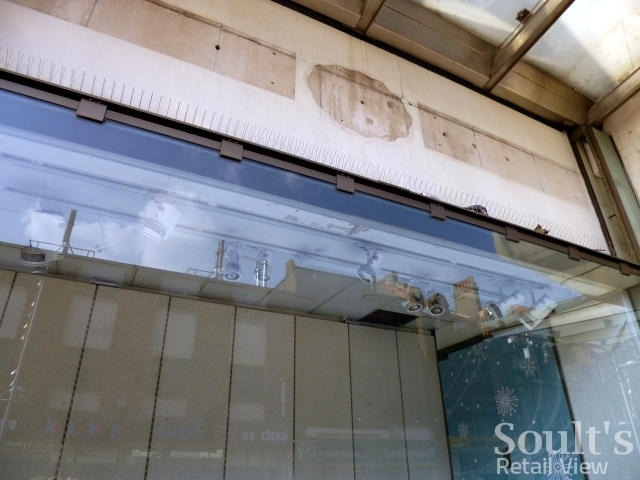 Not sure if this counts or not, but in Scunthorpe, there is a former Binns department store which has long since been taken over by a different department store company, but the “B” from the Binns logo is still on the glass in the doors! Ah yes! That’s one of the Westgate department stores that Beales *didn’t* buy, isn’t it? Love these old fascias. I think this was the standard way the signage was re-done for Somerfield as the Gateway name, which had survived until 1997, was exposed for a couple of days when my local store was converted to The Cooperative a couple of years ago. At the other end of town our second Gateway was taken over by Superdrug in the early nineties. During a recent refurbishment they uncovered the old signage along the top of the walls inside the store so we had a Superdrug with signage advertising ‘Souper Savers’ and similar puns for a couple of weeks. The original Somerfield stores were very expensive fit outs, much more like Waitrose is now. However it appears they were too expensive to roll out across the whole estate and the red/turquoise style store fit out was developed as a lower cost way of converting the remaining stores. A local curiosity was the Staines store which was trialled along with a couple of other sites in the new style but with the Gateway name above the door, ultimately it was decided customers preferred Somerfield. A chicken and egg question maybe but it has to be said that it’s very rare for a retailer to successfully change its name and that the most successful re-brands tend to be evolutionary. Chelsea Girl to River Island and the Sainsburys 1999 re-brand are the only two that spring immediately to mind. In fact, the Sainsburys at Blackheath near Birmingham, used to be really grotty inside, not refurbished for years and had the J Sainsbury logo outside (small version), it said “Sainsburys” in the large font. The aisles and signage were also dated. I know that store was supposed to have a small extension and presumably refit also, but not been there for well over a year now. I am not sure if it has been done now, the refit and extension?